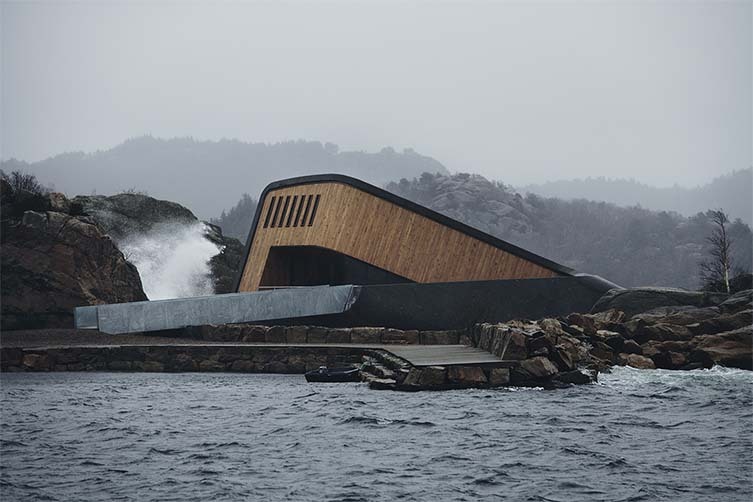 Dramatically plummeting five-and-a-half meters below the surface of the North Atlantic Ocean in Lindesnes, Norway, a quite unforgettable new experiential dining experience awaits guests who will be taken on a quizzical journey into the unknown. 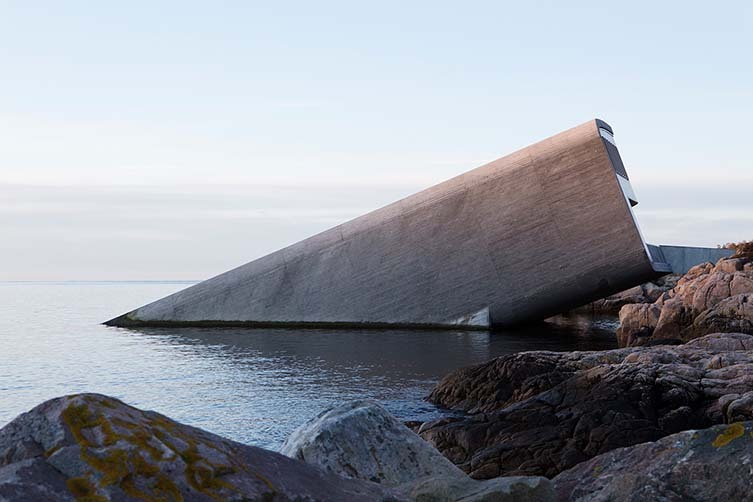 Under—serendipitously meaning both ‘below’ and ‘wonder’ in Norwegian—is Europe’s first underwater restaurant, located at the southernmost point of the country’s coastline; a place where marine species flourish and weather conditions switch from calm and serene to positively wild at any given moment during a day. 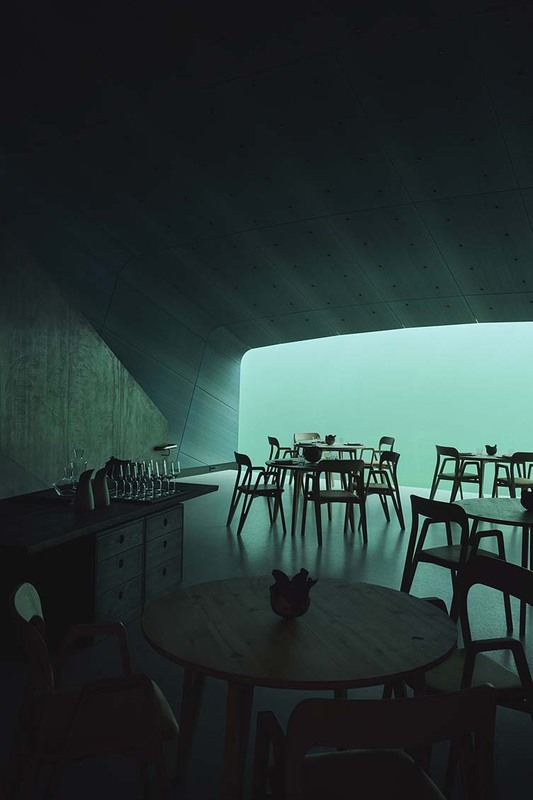 A craggy coast rich in biodiversity, it’s the perfect spot for a restaurant that serves as a homage to the wonders of the deep blue. 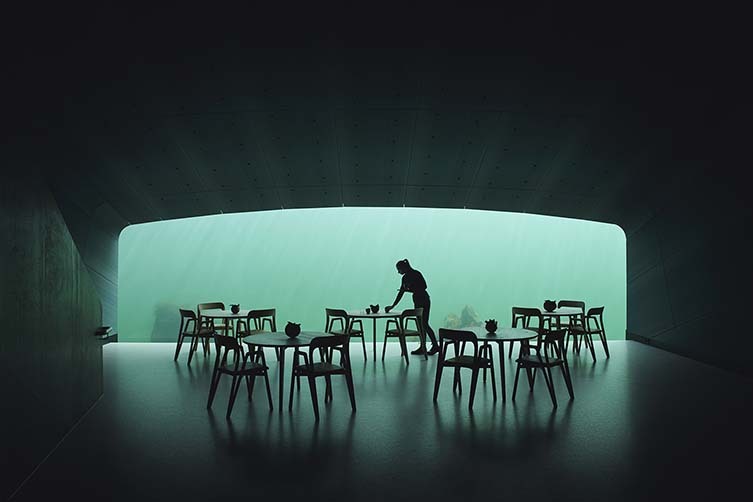 Housed in a 34-metre-long structure that has been half-submerged into the sea, diners will be able to take in panoramic views of the ocean bed, admiring the ecosystem and marine life in ways they otherwise may never see. 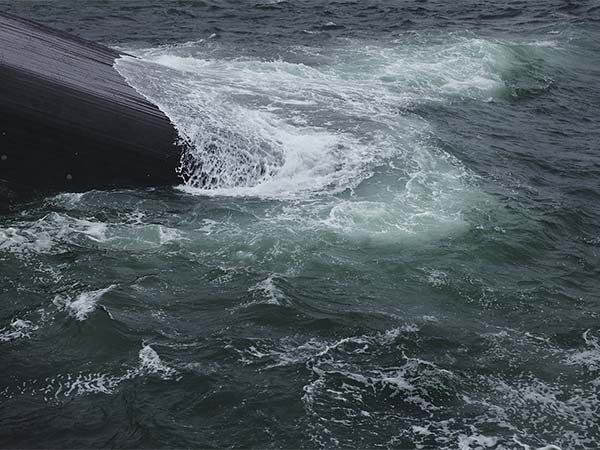 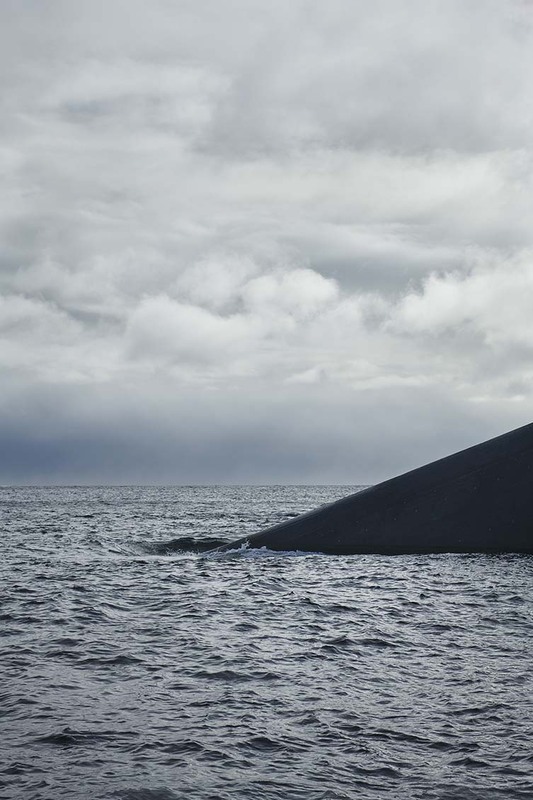 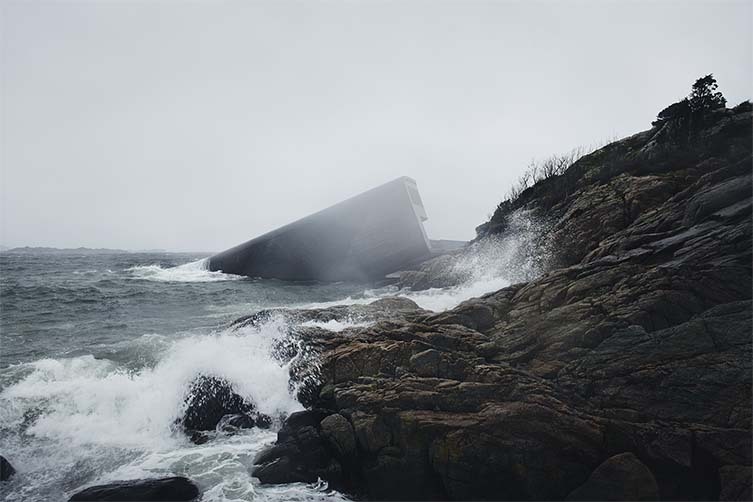 Designed with consideration for its geographical placing, architects Snøhetta created the container in such a way that over time it will embed itself into its surroundings—itself becoming part of the marine environment as the roughness of the concrete shell works as an artificial reef, welcoming limpets and kelp to inhabit it. 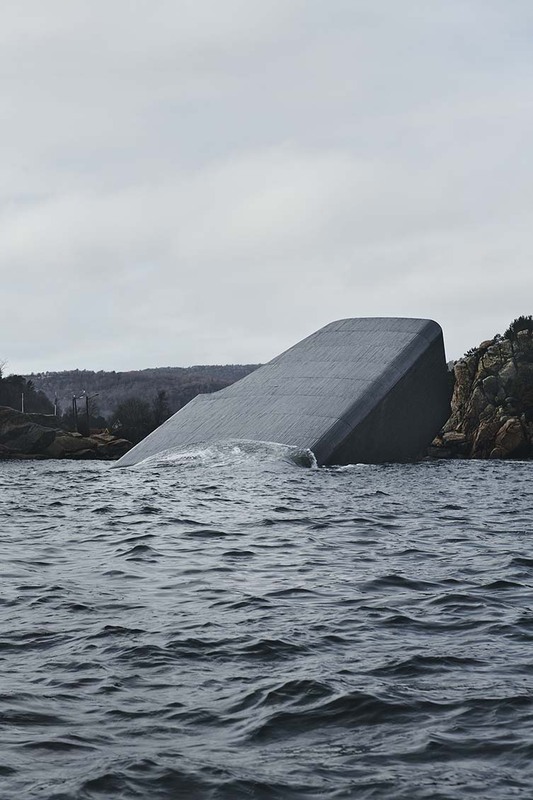 “Under is a natural progression of our experimentation with boundaries,” explains the agency‘s founder, Kjetil Trædal Thorsen. 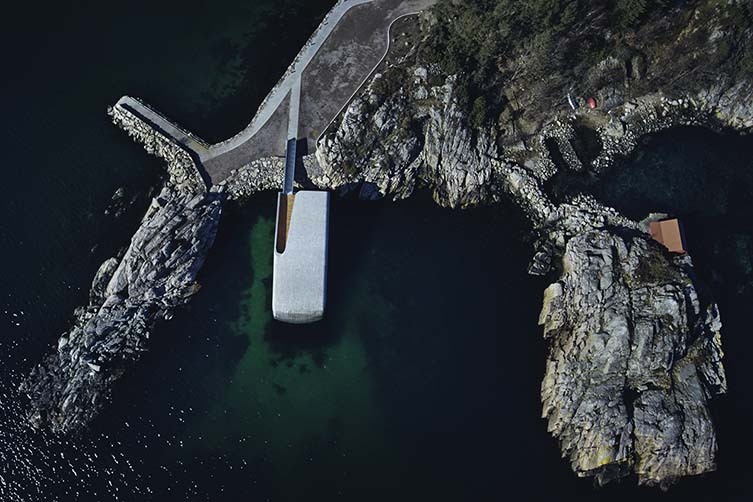 “As a new landmark for southern Norway, Under proposes unexpected combinations of pronouns and prepositions, challenging what determines a person’s physical placement in their environment. 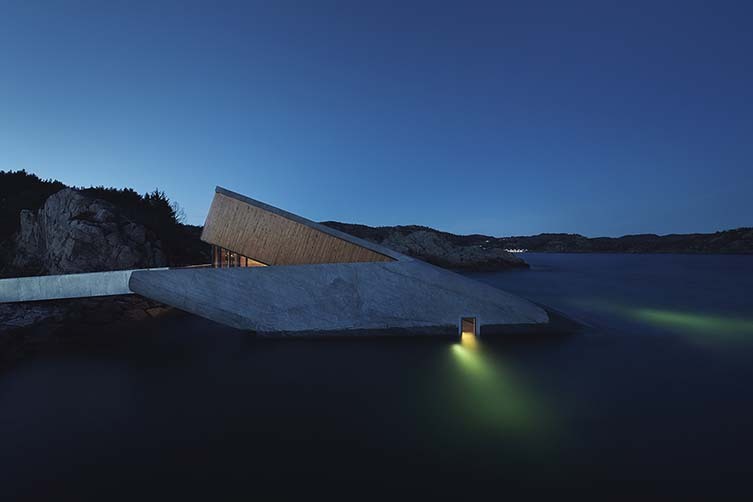 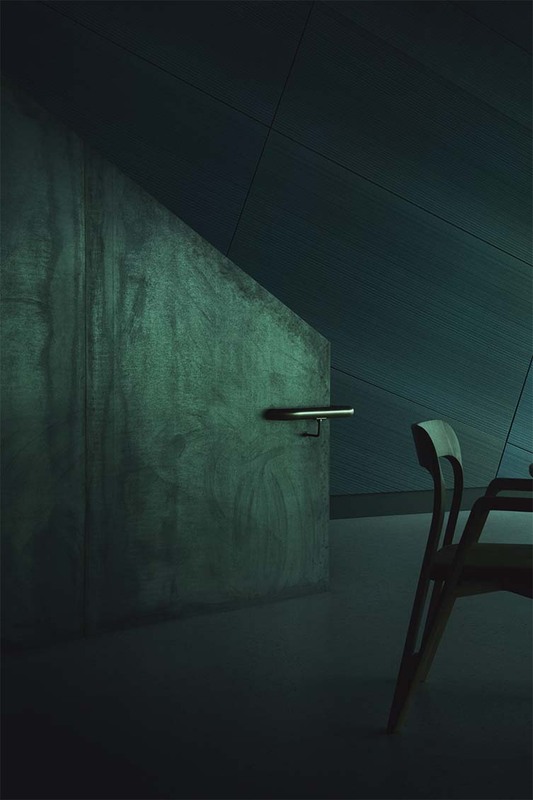 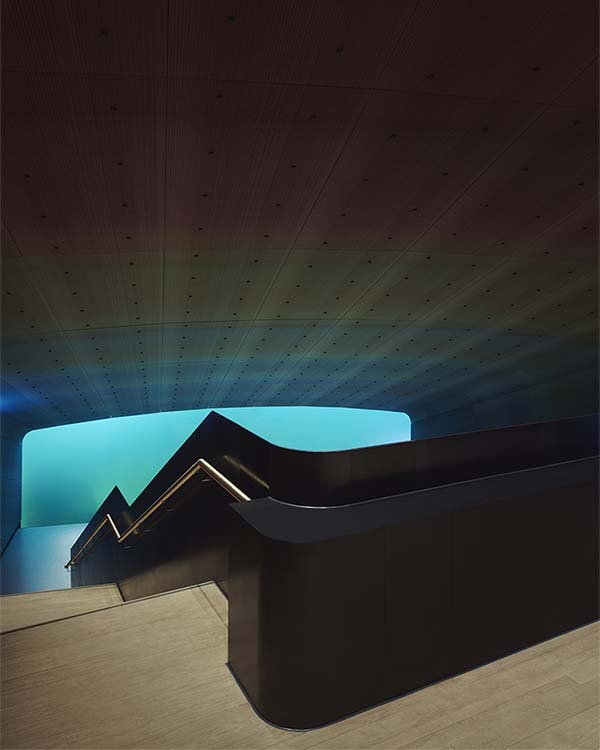 In this building, you may find yourself under water, over the seabed, between land and sea. 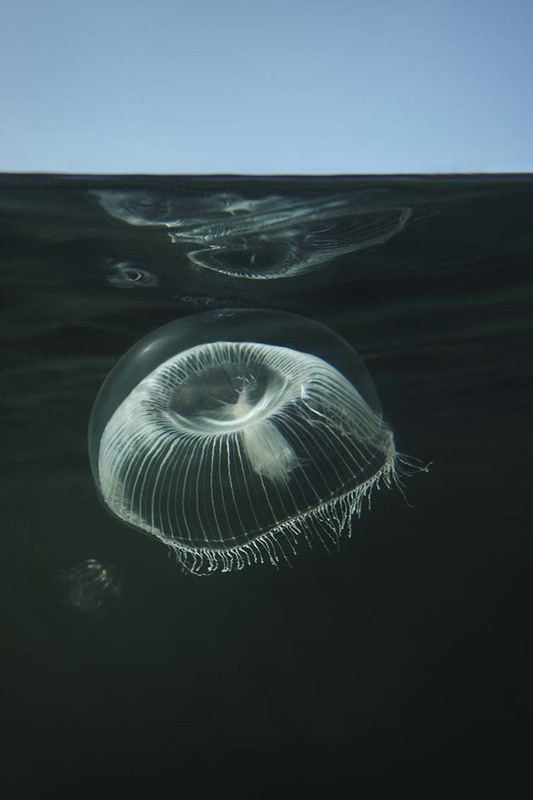 This will offer you new perspectives and ways of seeing the world, both beyond and beneath the waterline”. 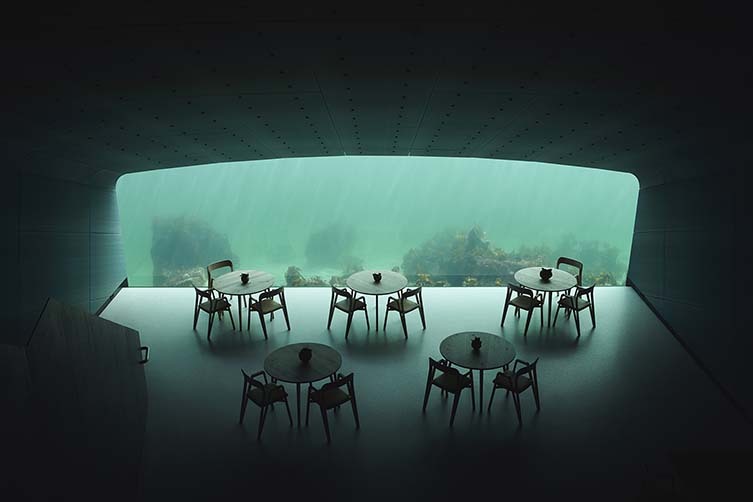 To protect against crashing waves, rugged sea conditions and aesthetically blend into its new habitat, thick concrete walls were built, wood, stee, and brass were used on indoor finishes, and the restaurant’s acrylic windows offer an arresting view of the seabed as it changes throughout those varying weather conditions. 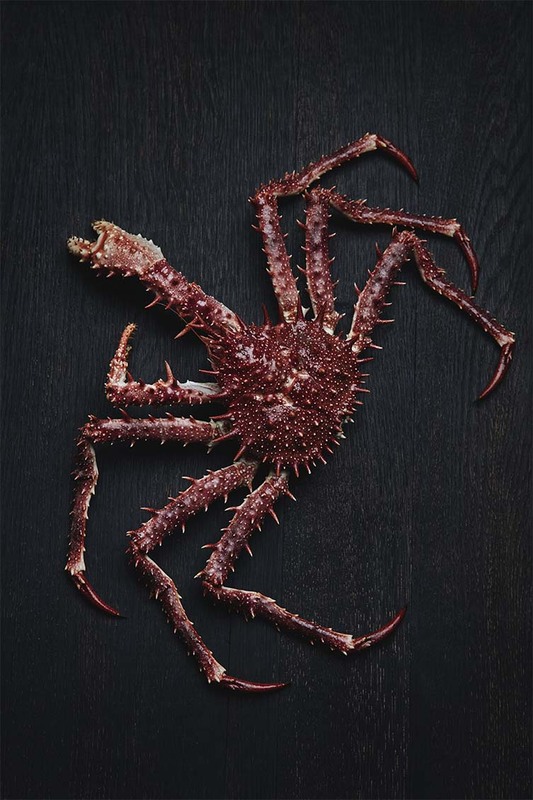 Chef Nicolai Ellitsgaard will be serving guests a menu focussing on fresh ingredients, dishes that showcase the season whilst pushing them out of their comfort zones, Under—located in such a remote corner of the world—is after all no normal restaurant. 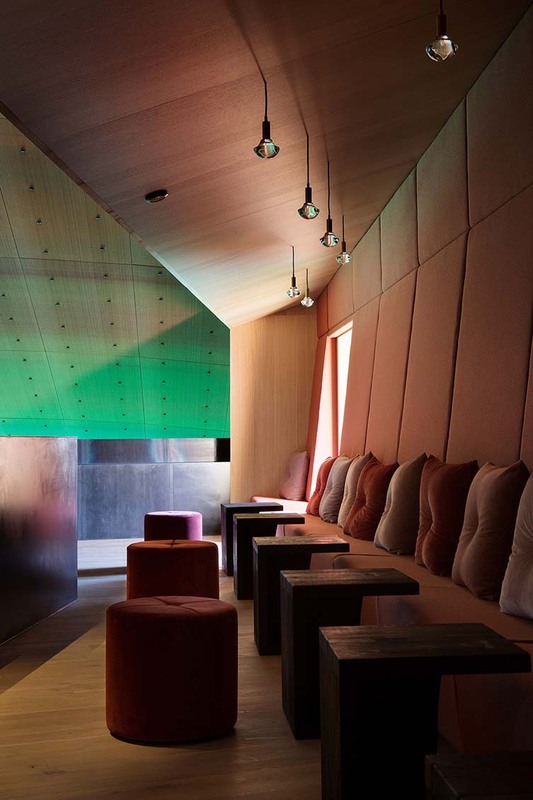 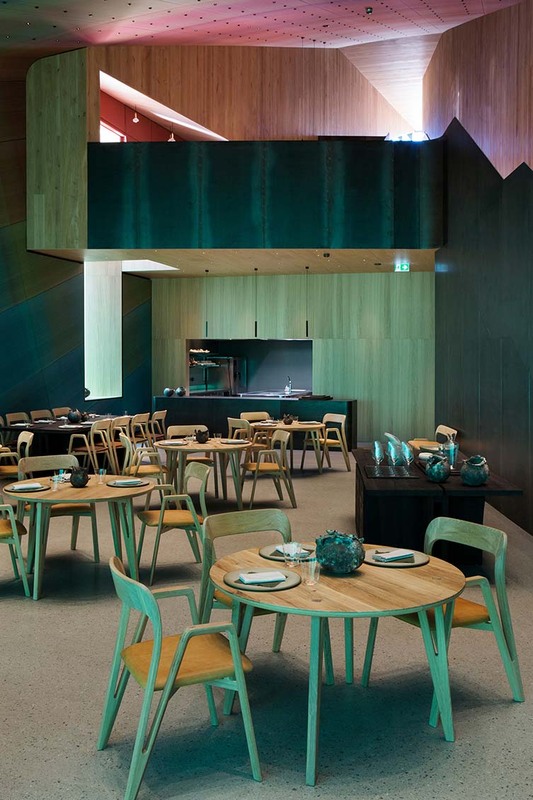 Brave and outlandish in concept, yet refined and respectful of its environment in realisation, Under is a breathtaking restaurant unlike no other, a truly remarkable one-off.